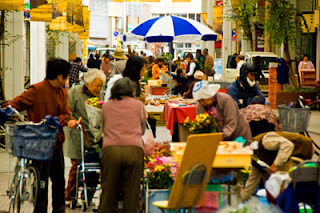 We paid a very brief visit to the Sunday market in Nakamura, and while it was short, it gave me a market hard-on. Let's just say I love open air markets. I love farmers markets. Flea markets. If there are people outside selling a bunch of crap, I'm there. Markets are the lowest common denominator in learning about cultures. So here's what I learned about Nakamura: It's small. It's simple. It's highly approachable. And really full of old people. The market totally reflects the city pretty accurately. We picked up a bag full of hot, freshly made obanyaki (basically little pancake-like buns) for today's travel... but they smelled so good we finished them during the 5-minute ride to the station. Oops. I'm now at the Nakamura train station, waiting for today's transport. I've bid adieu to Aunt Izumi, whose hospitality I will miss. Her constant insistence that I take a bath, however, I will not. I can only bathe one, maybe two times a day. Three times a day is pushing it. She needs to realize that I'm naturally brown, and that this un-Japanese skin tone will not simply wash off. When we get to Okayama, I'll bid farewell to Makoto, who will go back to Aunt Hiroko's as my mom and I stay the night before moving on in the morning. I'll miss Makoto as well. Not just for his food knowledge and shared curiosity about all things edible, but for his ability to CONSUME MASS QUANTITIES. It's nice that in this nation of small eaters and lithe figures that there's someone who can inhale as much food as I can, with curiosity and general gluttony outweighing common sense and that feeling most people get that says, "You're full. Stop eating." Apparently, neither of our stomachs are armed with that apparatus. I will not miss, however, every room of the house smelling like smoke. So... what's in Okayama? Who knows? I don't know. I don't really care. My mom was kind enough to book us a night there so that I wouldn't have to suffer another miserable travel day. We'll be in by late afternoon, so we'll have time to relax, get something to eat, and who knows? Maybe I'll find an internet cafe (yeah, right) and upload this post. Because today I also say goodbye to a reliable internet connection. I'm pretty much on the road from now on. If you love open air markets, go to India. The whole freaking country is an open-air market because, well, they just don't have many stores. Although I heard they now have ONE supermarket in the country, and that's in Bangalore (where all the Western IT workers are). Figures.